Oxford Research & Policy was commissioned by Vitae to conduct an independent review of key national and international stakeholders with an interest in, or responsibility for, researcher development. 55 semi-structured interviews were conducted, equally divided between international and UK stakeholders. Most interviewees were in leadership/senior positions. 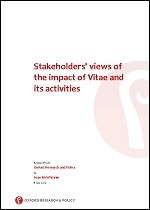 the value of some of Vitae’s activities and resources (for UK stakeholders). A key outcome from the review was the view that Vitae has a positive and transformational impact on the researcher development agenda. In particular, international stakeholders believed that the UK is benefiting from a reputation for being world-leading in providing professional and career development for researchers, both in attracting researchers to the UK and benefiting from better trained, more innovative researchers. opportunities for Vitae to extend its reach, activities and funding through working more closely with other UK groups and beyond the UK.